Even though the clouds have rolled into the area temperatures are still going to be on the mild side. In fact highs today will be identically to where we were yesterday afternoon. So a pleasant Wednesday afternoon expected under partly sunny skies, with highs in the mid to upper 70s, still a bit breezy with winds gusting to 25MPH out of the southwest. 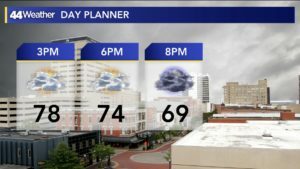 Cloud cover will remain overnight and will stay dry until daybreak Thursday. Lows will dip into the upper 50s to low 60s. 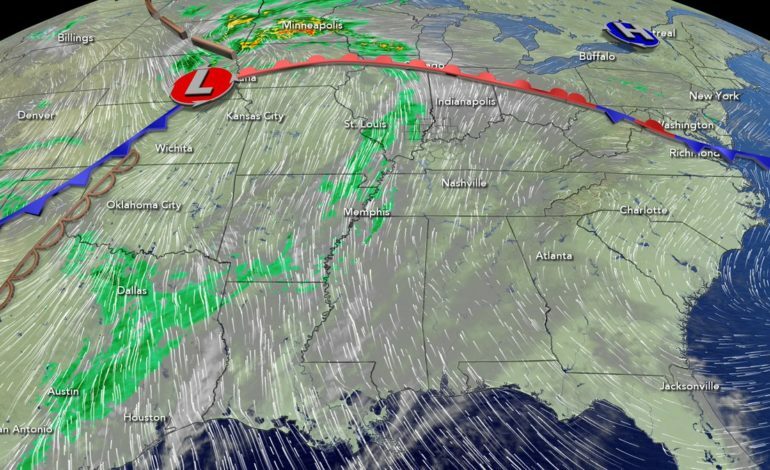 A cold front stretching across the Plains will advance eastward spreading showers and storms into the region. 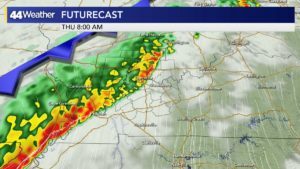 Expecting the rainfall to begin in our western counties after 6AM and spread into the Evansville area around 7AM, rainfall could be heavy at times with thunderstorms. Scattered showers will continue through midday before another round of heavier rainfall builds into the region late afternoon – evening. A few of those storms could be on the strong side with gusty winds, some isolated flooding can’t be ruled out as well. The rain appears more widespread through the evening. The latest SPC outlooks maintains a “Marginal” risk of severe storms across the Tri-State to “Slight” risk south of Madisonville. Some storms may contain damaging winds and hail. 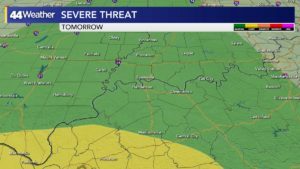 It does appear the more favorable conditions for severe weather will be south of the Tri-State but an isolated severe storm can’t be ruled out. Regardless of severe weather threat, heavy rainfall looks likely. 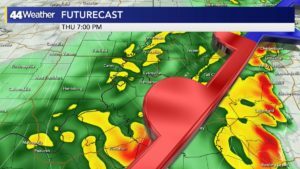 Up to 3″ of rainfall is possible with locally higher amounts. 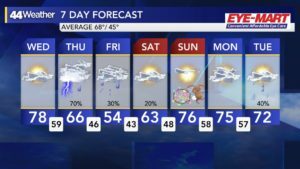 Expect a cloudy raw Friday, with a few lingering showers and areas of drizzle. Will likely hit our highs just after midnight in the 50s and fall throughout the day in the 40s as northwest winds move in. Some models are bring some showers into the area Saturday, but I think will be mainly dry and in the low 60s. So still below average. But things change heading into Easter Sunday, look for mostly sunny skies and temperatures soaring back into the mid to upper 70s.